Payment can be made by Visa, MasterCard, debit cards and any other methods which may be clearly stated on our site from time to time. You confirm that the credit card/debit card being used is yours or that you have specifically authorized by the owner to use it. We will take reasonable care to make our site secure. 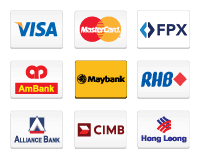 All online banking transactions on this site are processed using senangPay, which is a secure online payment gateway that encrypts your details in a secure host environment. In addition, we will take reasonable care, to keep the details of your order and payment secure, but in the absence of negligence on our part we shall not be held liable for any loss you may suffer if a third party procures unauthorized access to any date you provide when accessing or ordering from our site. Kindly take note that we will process and send out all order within 1 – 3 working days after payment is received. Estimated delivery times provided are to be used as a guide only and commence from the date the order is sent out. We are not responsible for any delays caused by destination customs clearance processes.